The SpaceX Dragon and the International Space Station orbit above the Bahamas in the Atlantic Ocean. Expedition 56 crewmembers collaborated for the second day in a row studying how living in microgravity impacts rodents. The space research onboard the International Space Station is helping doctors keep astronauts healthy in space and while developing advanced therapies for humans on Earth. Rodent research, and a variety of other life science studies observing organisms in space, has been ongoing for years aboard the orbital laboratory. The latest experiment, Rodent Research-7, looks at how microbes affect the physiology of mice. 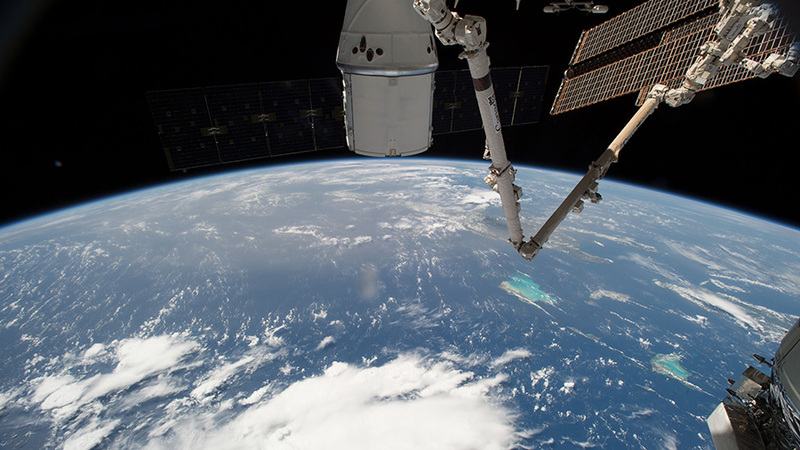 The mice and research gear were delivered July 2 aboard the SpaceX Dragon. Scientists are seeking to understand how microbes affect the gastrointestinal, immune, metabolic, circadian, and sleep systems. Astronauts Drew Feustel and Alexander Gerst collected blood samples and measured the bone mass of the rodents today. Flight Engineers Ricky Arnold and Serena Auñón-Chancellor contributed to the research work stowing biological samples in science freezers. The samples will be returned to Earth Aug. 3 when Dragon splashes down in the Pacific Ocean for retrieval and analysis by scientists on Earth. We have just watched the space station fly above Great Massingham in Norfolk,England. The space station orbits above Earth at an average altitude of 250 miles.